Entering their match with the Washington Spirit, the Seattle Reign had lost two straight and were looking for a bounce back win. In front of a crowd of 2,703 on the Moda Pitch at Memorial Stadium, the Seattle Reign ended their two game losing streak with a 3-1 victory over the Washington Spirit. This was the Reign's first home game since week one of the NWSL season and they made sure the home fans went home happy. 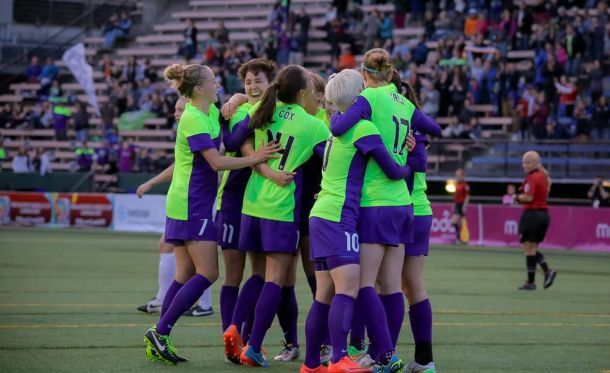 The Reign dominated the first 30-35 minutes of the match and finally found the back of the net in the 35th minute. Merritt Mathias put a cross into the box that found the foot of Beverly Yanez. Yanez was able to get the ball past goalkeeper Kelsey Wys for an early 1-0 lead. That would be all the scoring in the first half as Seattle headed to the locker room with a 1-0 lead over the Spirit. The Reign wasted little time getting back on the board in the 48th minute. Last year’s league MVP, Kim Little, sent a cross into the box that found the head of Mattias and she was able to put the ball into the net. The Spirit would not go away though. Washington finally got on the board in the 62nd minute to cut the Reign lead in half. Crystal Dunn connected with Joanna Lohman on a through ball that she was able to put past Reign goalkeeper Haley Kopmeyer in the bottom corner of the net. Just 12 minutes later in the 75th minute, the Reign put the game away. Little found a streaking Jess Fishlock and played a beautiful through ball that Fishlock was able to get to just before the onrushing 'keeper in Wys. The ball rolled the final 18 yards into the net. The best part of the entire play was Fishlock's run that was roughly 32 yards according to the Reign's Twitter timeline. If you want to see it, check out their timeline. It is a thing of beauty. That would do it for the scoring on the night. Overall, it was a much needed win for the Reign who now finds themselves one point out of first place, sitting behind the Portland Thorns and Chicago Red Stars. Both teams finished the match with 14 shots; Seattle had seven on goal while the Spirit has just five. This will be a tough stretch of games coming up for the Reign without goalkeeper Hope Solo and forward Megan Rapinoe. The two are now gone from the team to prepare for the 2015 Women’s World Cup. Seattle will head back out on the road, their third in four matches, to face Sky Blue FC this coming Saturday, May 9th.